On Sunday, 25th May, 2014, a total of 27 Legion members took part in a work party to ensure that the Branch is up to snuff for the D-Day Parade week. Members of the work party split up into groups and did various tasks around the branch including sweeping the parking lot, checking plants in the front gardens, planting new plants around the Legion property, cutting down and mulching a total of 5 full grown trees and spreading the mulch on plants around the property. After the work was done, everyone enjoyed a delicious meal brought in by fellow comrade Peter Martin and prepared by Marie Kobylinski. We hope that we can accomplish as must when we hold the Fall Work Party on 2nd November, 2014 to prepare the Branch for the Remembrance Day week. 1. 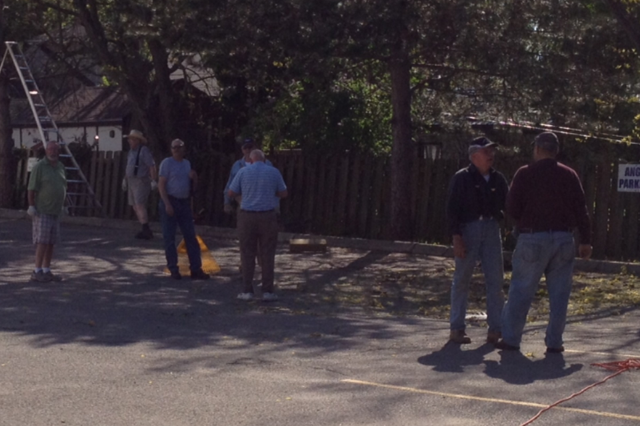 Work Party members pause and cleanup before felling the next tree. 2. 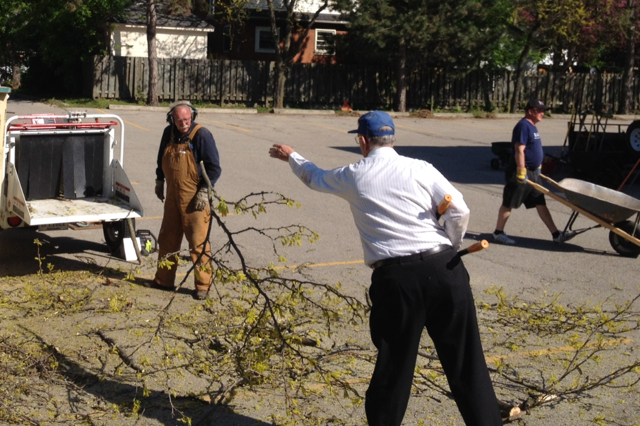 Hal Hamilton feeds branches from the trees into the shredding machine with the help of Jim Byron.